My favorite past time, even before sewing, is thrifting. Before Ebay or Craigslist was even a twinkle in the eye of the not yet discovered internet, I could be found with two young boys in the local Goodwill in Sunnyvale, California. There I would find treasures, learn my personal taste and the kids would always find a few fun things too. It was the way that enabled me to stay at home as a young military family in one of the most expensive places to live. 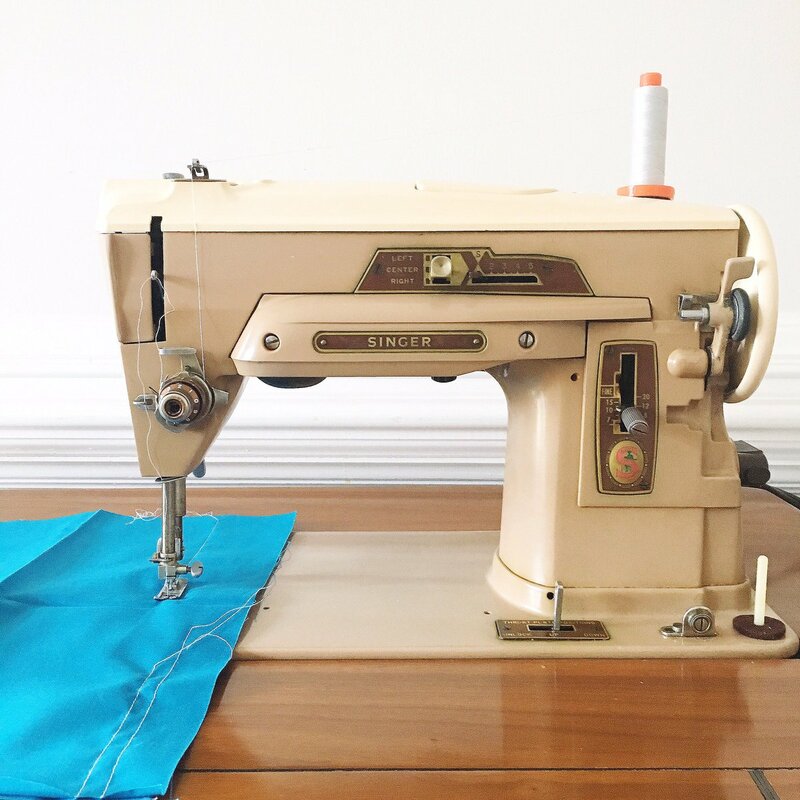 My love of thrifting went way beyond being frugal, it was a way that I could rescue furniture, vintage clothing and when I discovered SEWING MACHINES at the thrift shops, I was absolutely giddy! Vintage all metal machines are amazing! They are well made, can sew through anything from silk to concrete( not really but pretty close) and with a little love and care, they will last a lifetime. That is how they were built. You can find vintage machines inexpensively compared to many new machines. They could need some work to get them going. An investment in a vintage machine ( pre 1980) for minor repairs is well worth it! Even though I was NOT looking ( I SWEAR on the Singer Sewing Manual), I walked in to a Goodwill and there, at the front door, was a sewing machine cabinet. It was meticulous. A sewing cabinet that is in perfect condition is very rare! It was unlike any I have seen previously, so it really intrigued me. I was pretty certain I would find a lovely old Kenmore or maybe a White but what I found instead was a Singer 403. Let me repeat that... A SINGER 403 Slant-O-Matic! When I opened the top and realized what I had found, my heart started to race a little. The price on the machine was $39.99. It was out of my range of what I would normally pay for a vintage machine. The machine had a manual, all of the cams and the lid for where the cams are inserted was still intact. By this time, an older gentleman came up in interest and started a conversation about the machine. He was just as interested as I was ( which made the machine even MORE interesting to me...lol) in what it was and the condition. He was telling me that he had a collection of sewing machines at home but he does not even sew! He is not the first man to tell me this in a thrift shop! It is interesting to me how many men collect sewing machines for their beauty and interesting mechanics. After we chatted for a bit, I put the sewing machine back into the cabinet, thanked him for the lively conversation ( he was so funny and kind) and decided that the machine was really not for me. Two days later, I was in the same area and just had to stop back in to see if the machine was still there. When I walked through the door, it was gone! Then out of the corner of my eye...I spotted it! Someone had moved it to check it out. I walked up, opened the case and then tried to turn it on. DRATS! No power. The machine was plugged in properly. I checked all of the wires and there were no splits or severed bits. I was sure it was something else. I picked up the extension cord and followed it to a plug in the wall...it was unplugged! I plugged it in and OMG!!!! It WORKED!!!! Not only did it work, it was strong and not sticking at all! and there was another surprise! I hidden compartment with attachments! That was IT! This machine was meant for me! I picked it up and carried it to the checkout. There, in front of me, was a lady with loads of plates and bowls. She was admiring the cabinet. She also had tales of vintage sewing machines. She was also someone that did not really sew ( like the gentleman two days before) but had a collection of vintage machines given to her from family members. We chatted for a few minutes and she plopped a 20% off coupon on top of my cabinet! WHAT!?! I said thank you many times over! So generous of her to help enable me to rescue this lovely machine! I am usually not a drop in bobbin fan but I love this one, especially since I figured out how to adjust it! The door that opens to reveal part of the magic! and even the tension discs... YES...I am a freak! Someone had asked me about threading this machine. It is very easy! If you do not have a manual, the door on the side has the thread guide right inside! I will have more on this machine as soon as my iPhone decides to start cooperating with my computer😉 Silly phone! Do you have vintage machines? Which one is your FAVORITE? For now, I am pretty smitten with this one 💗💕💗 Now to find a NAME! My four sisters and I learned to sew on a machine like this. My mom made a lot of our clothes on it. I personally like the newer machines but this one has special meaning. Thanks for bringing back memories of time spent with my sisters today! I have a random collection of vintage sewing machines- most are just decorating my sewing room! I do have one which is missing the key to the hard case! When I work out how to open it, I'll be using it, that's for sure! From memory, she is very similar to this one! I LOVE your machine!! Especially when it was meant to be~ a Great sewing machine love story! ConGratuLations & ENJOY!! What a beautiful machine. Someone loved that sewing machine and took excellent care of it. Sad that so many of these great old machines are just sent to the thrift stores by someone who has no idea of their real worth. Great find for you and 20% off! Can't beat that. Enjoy your "new" machine: Luckily it has found another loving owner. I just got a 403 Slantomatic from my boss! Her mother in law passed away and it didn't sell at the estate sale. I also got the card table with the cut out for the machine to sit in. I haven't tried it yet, but will soon! I have 6 vintage Singers and 1 vintage Kenmore and I love them all. My Singer 128 I purchased ($20.00)for decorations as the scrolls are beautiful and so is the Bentwood case. It is operated by knee lever (found on Ebay) with oscillating bobbins which I found at an estate sale. I piece on my Singer 15-91 which has an excellent balanced straight stitch. Perfect! I have a Singer 301A, a Featherweight, a mint green Singer 15-125 and another Singer 15-91 that I am willing to rehome. The vintage Kenmore sews like a dream but is not good for piecing because the feed dogs are too wide to get a good 1/4" seam so I sew everything else on it. That's the sewing machine my mother had and I first learned to sew on. It is sitting in a storage unit in North Carolina awaiting my arrival back there next year. I stopped using it as the tension was always out of adjustment. And the sewing table....well, that came from my other grandmother! A bit of memory there. Just curious - when did you find and purchase this one? At first I thought it was back in the day but then I thought you had recently bought it???? It's lovely either way. Love your story. Nice to know I'm not the only one who shopped at Goodwill (always had a tape measure in the purse with the kids current measurements) all those years ago. I'd name her Blondie! 👩🏼She's a pretty girl! I love vintage sewing machines and have several but only three that I use , one is similar to this ,it is a 401 and also has cams , I love it . My favorite is my Singer 15/91 straight stitch only machine , just amazing . I think you will really enjoy your machine and you certainly got bargin! What a magnificent Singer! I love the name Slant-O-Matic, so retro. I went a little vintage crazy last year and now have 3 Singers, a Bernina and a green Planet (not too sure about history of this one). I do use them and you're right they can and do sew through just about anything. Enjoy you new machine! 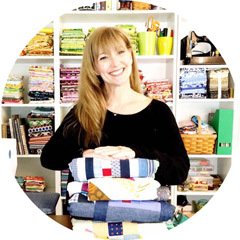 I love a post with love in it....sewing love...great find..congrats. Her name is Lucy, don't you think? I have a vintage Bernina Record 830. My mom got it from a radio call in show in Kansas 15 years ago... Bought it from the niece of the lady who had passed. Paid $50 for it and spent another $100 getting it fixed. I LOVE her. I keep thinking that someday it would be nice to have a few of the modern bells and whistles, but then I look at the prices on new machines and... This old gal and I are just fine. She does everything I ask, except button holes, and doesn't miss a beat. I grew up using the 730 and honestly, I like the 830 better. OMG !! It's like looking at my moms sewing machine!! I learned to sew on that one!! Even the cabinet ......thank you for thr happy memories! Hi; My name is Miller, I too am a man who collects sewing machines. I do also sew, mostly quilt piecing. I mostly use treadles & handcranks but do use some electrics (Tailed machines). Among my collection I have a couple of 403's, couple of 401's & a 500, all Slant-o-Matics. They are indeed great machines. Just one caveat, be sure you have smooth bobbins. Many modern bobbins are rough where the hub joins the sides & on a top loader these will insure that your thread will break. Should you start to experience thread breaking check that bobbin First Thing, its most likely the culprit.